I hope this message finds you healthy, inspired, and far from apathy. This tender passage speaks volumes about Mashrou’ Leila. They have captured what it is like to be young in the Arab world, and understand their listeners, sometimes better than they understand themselves. Amidst revolutions, uprisings, springs and autumns, Leila’s music cuts through the chaos with crystal clarity. Influenced by a wide variety of artists from Fairuz to The Beatles, the band has given fans an anthem that takes the foreignness of radio music and the tradition of their parent’s favorite singers and merges them in such a way that they become their very own. Mashrou’ Leila began exactly as the name suggests, a night’s project at the Department of Architecture and Design at the American University of Beirut where the band members were studying at the time. Three of the young artists, Haig Papazian, Andre Chedid, and Omaya Malaeb posted an invitation to a jam session. Out of the twelve musicians that answered the call, they gained vocalist Hamid Sinno, bassist Ibrahim Badr, drummer Carl Gerges, and guitarist Firas Abou Fakher. Mashrou’ Leila was born. Together, they look like any other group of Lebanese young people – the men with facial hair and dark eyebrows, and Omaya, the only girl, with big almond eyes. I spoke to lead singer Hamed Sinno, once described by a friend as “an intellectually rebellious art student whose presence never went unnoticed,” in part due to his beautiful voice and in part due to his sharp wit. I asked him about the band’s influences. “We’re big omnivores and we have very different taste, but in general we consume a bit of everything. There are a few bands the seven of us like collectively…The Beatles…Radiohead.” It is a simple but difficult question, because Leila is so different from anything people have heard before. The Daily Star once described Mashrou’ Leila as “the voice of a generation”. According to Sinno it was “super flattering” and “went straight to heads”, but doesn’t stop at that. “I don’t think there really is such a thing as one ‘Arab youth’. We come from complicated societies, and the place where music is coming from is a lot more complicated than seven people sitting and making music.” This abstract body that has been called “the Arab youth” has been grouped, lumped, spoken for, and manipulated by so many foreign and local media. All of this pales in comparison to Mashrou’ Leila. The key is simply authenticity. “It resonates with people because we come from the same places that other people do, and had to deal with the same structures that other young Arabs have,” says Sinno. The shared experience comes through in the motifs of their work. Their songs have been marinated in Arab culture. From jasmine blossoms to marital pressures, Sinno’s lyrics paint an irresistible portrait. The video for the song ‘Fasateen’, dresses, begins with a disenchanted Sinno singing from behind the wheel of a car ‘remember when you told me that we would get married without a house or money, remember when you used to love me even though we were from different religions?’ We realize then that the car is being towed, and that he is not the one in control. One by one, the members of the band renounce traditional wedding symbols and join Sinno in the car. A bouquet is blended, a cake is spattered, and a dress is shredded. In the video for the song “El Hal Romancy”, a somber bride climbs up staircase after staircase until she gets to the top of a building. She is perched on its edge contemplating a jump when the camera floats up to the sky and the video ends. It is all done in good fun, but is not free of criticism. “When we write our songs it’s always a byproduct of everything we’re living. When you’re in Lebanon and you’re our age, everyone starts getting married and your family is always trying to hook you up with people,” says Sinno. “I guess marriage is one of those monolithic institutions we’re constantly confronted with.” It isn’t the only institution Leila is challenging. From the very beginning, Mashrou’ Leila was performing their own music. “It was a very charming, intense time for all of us because we were just playing for ourselves and for our friends, doing whatever came to mind,” says Sinno. After quickly establishing a reputation in the underground indie scene, they went on to win Radio Liban’s Modern Music Contest with their song ‘Raksit Leila’, which was an immediate hit. Raksit Leila alone contains too many influences to count. A catchy violin melody layered on top of a warm piano and plucky guitar start the song off. Somewhere in the middle it slows down and fades to a tribal tangent, which gets picked up by salsa drums and piano. In moments, it is back to a hip-swaying whistle in a transition that can only be described as seamless. This is all topped with Sinno’s rich voice that can go from sunny to brooding in a heartbeat, but is always thick as molasses and brimming with soul. The whole thing is lighthearted and loveable on so many levels. In the video, eggplants dance along with the band in a colorful kitchen. From there, Mashrou’ Leila released their anticipated self-titled first album in a warehouse concert where they sold out every copy. Everywhere in the world now, a band’s reputation is built online. Here also, Mashrou’ Leila proved to be ahead of the curve by releasing their EP El Hal Romancy, the solution is romantic, for free digitally. “If you’re feeling supportive, it’s available for download on iTunes and Amazon. The Byblos International Festival is one of the largest music events in Lebanon. Mashrou’ Leila landed a spot there in 2010 and played to a thrilled and rowdy audience that included Prime Minister Saad Hariri. Hariri reportedly left thirty minutes in after the provocative lyrics proved too much for him. Mashrou’ Leila is nothing if not controversial. To an outside listener, their lyrics might seem benign, but they are laced with potent sarcasm towards Lebanese society. They have dared to address sexuality, desire, and social taboos in a society where much has been historically self-censored out of art. At Byblos, Sinno waved around a rainbow flag. On stage, he is reminiscent of Freddie Mercury, and has just as much of a presence. Sinno and the entire band want the members of the crowd to dance to their music, shout along with their lyrics, and cry at their poetry. He was the first Arab pop star to come out as gay when the song Shem El Yasmine debuted on their first album. The song is a slow ballad with the resonance of a sunrise that follows a love affair between two men. At first, the song uses the ambiguity of the Arabic language to obscure the subject of the song, but it becomes clear when Sinno sings that he longed to be the subject’s woman. There are few acts in the East or the West that can match what Leila brings emotionally to the microphone at each live performance, and Shem El Yasmine is one of their most moving epics. It starts slow with a honey sweet bass, and gets progressively brighter and faster. It is packed with opportunities for Sinno to show of a sensual and versatile voice. “It’s a love story,” he says simply. “A big part of the band experience for me personally is getting the lyrics across,” says Sinno, who writes most of them himself. One can easily picture him jotting lyrics into a notebook. For those who can understand them, his lyrics invoke a rare swell of emotions, of them longing, childlike happiness, and pride. Pride because Leila has allowed us to share in their success. Sinno’s words are informed and intentional. Shem El Yasmine was inspired by a mix of Proust and essays on masculinity in the modern Middle East. ‘Smell the jasmine, taste the molasses and tahini…. remember to think of me’, begins the song, meant to invoke the involuntary memory of childhood through a favorite breakfast food. 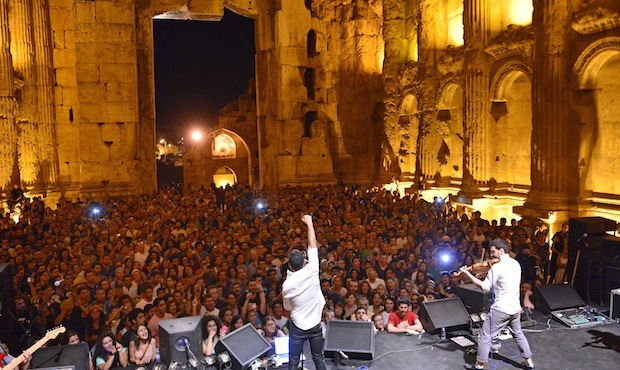 From Byblos, Mashrou’ Leila left their post-Phoenician fan base and travelled to several other capitals, from Tunis, to Abu-Dhabi, to Amman, and to Cairo. At every concert the fans were young, loyal, and thrilled to see them. Leila has groupies. In Amman, they performed on a stage beneath the historic Citadel. In Cairo, fans stormed the stage. The band has something very few people have been able to achieve thus far – pan-Arab appeal. “It sort of happened by accident,” says Sinno. Leila’s trajectory will be interesting to see and hear, as the next album is reportedly “a lot sexier, a lot more about visceral, corporal subject matter.” So much about the future of their music and their lives is unknown, but one thing is clear, Mashrou’ Leila isn’t slowing down for anyone.